Only the current Account Owner can designate another User as the new Account Owner. 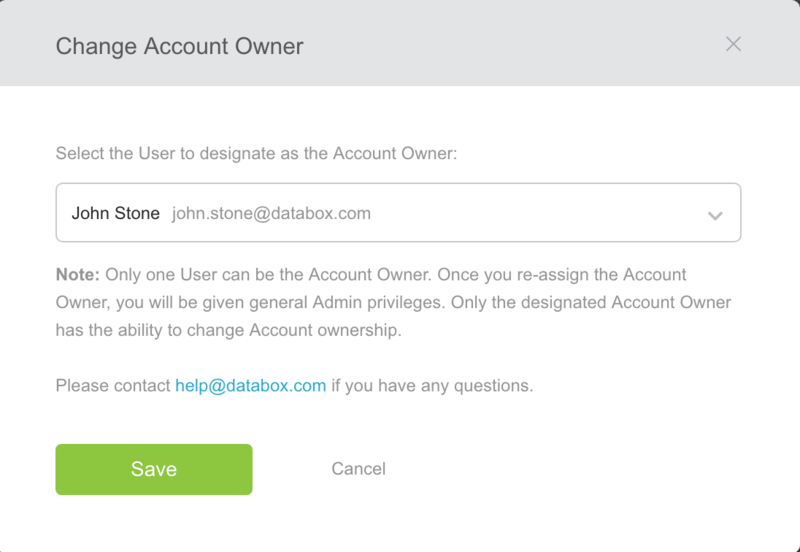 If you have a Databox Agency Account and want to update the Account Owner of your Client Accounts, the Agency Account Owner is the only User who can make this change. If the current Account Owner is no longer with your organization, please email Support at [email protected] for assistance. To change the Account Owner, navigate to Account > Account Details. Below your name and email address you'll find a text link to Change owner. From there you can designated the new Account Owner from the list of Users on the account. FOR AGENCIES: Only Agency Account Owners can change account ownership at the Agency and Client level.